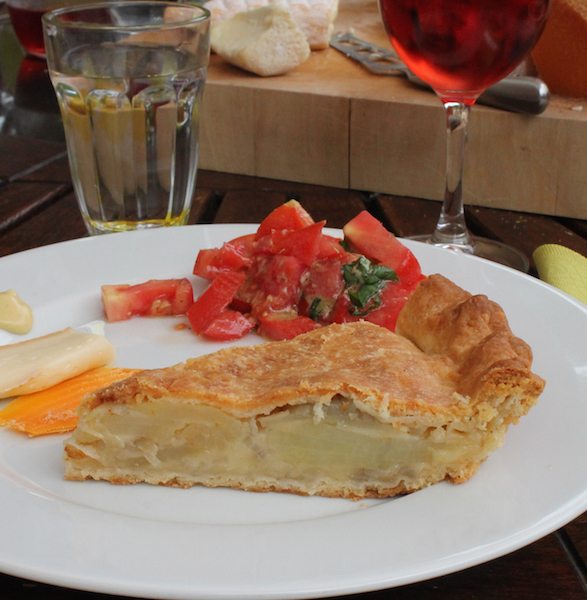 Modeled on a Lancashire cheese and onion pie, this guy has a decidedly French accent with the substitution of Cantal for the Lancashire cheese and shallots for the onions. I sliced in some waxy potatoes to make the pie a little heartier and added cheese to the shortcrust for even more flavor, both good decisions. Last week I was staying with dear friends in the Lot-et-Garonne region of France. Daily trips to the markets were de rigueur as was a bunch of cooking and baking in their gorgeous big kitchen. Boy, did we eat well! The first night we arrived, there was a special meal of confit de canard accompanied by golden crispy potatoes roasted in duck fat. The next evening it was a vivid paella with chorizo, merguez, chicken and prawns. Yet another dinner boasted a festival of sausages (lamb, duck, horse, horse, pig, pig and pig – of different styles and spices) with lentil salad and a Champagne tasting. Of particular note, on the last night, we finished with Caroline’s Nectarine Crumble, a baked delight of sweet nectarines lavished with rum, topped with crispy crumble and served with ridiculously thick Normandy cream. 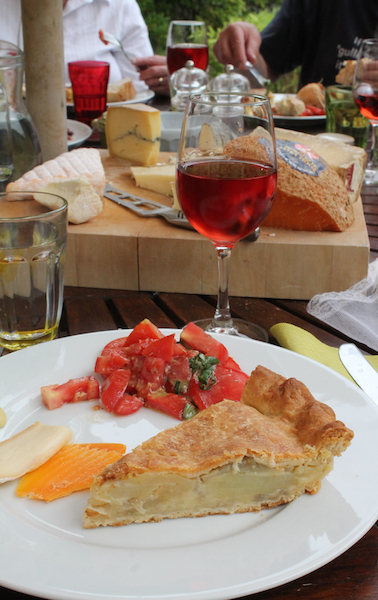 Lunches were myriad cheeses, fresh bread, fabulous salads, the most amazing summer tomatoes and fruit. And, because I had thumbed my way through The Good Cook* by Simon Hopkinson, two tarts. The first one, this one, was named My Mother’s Lancashire Onion Pie so I should properly call this Not Simon Hopkinson’s Mother’s Lancashire Onion Pie. But I thank him kindly for the inspiration. 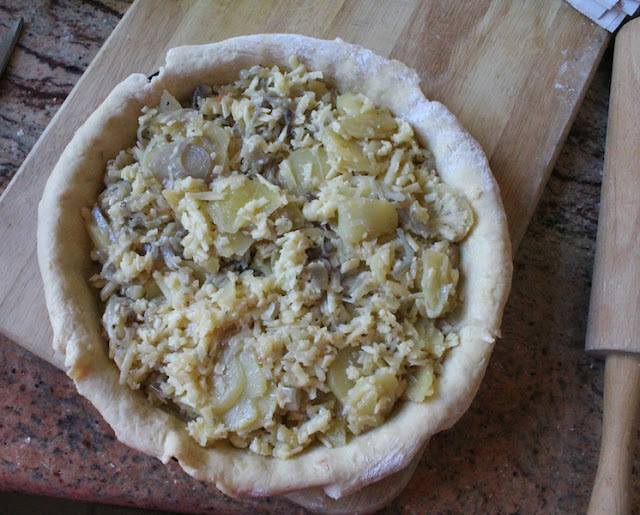 The second one already started out with a French bent - Roquefort cheese and leeks – to which I added some thinly sliced cauliflower. Perhaps I’ll be sharing that at some later date. 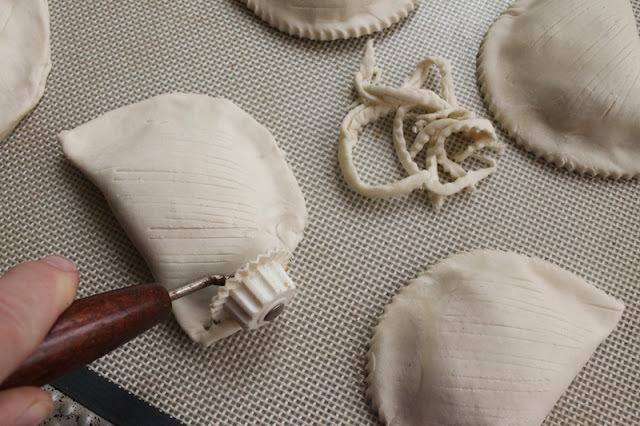 First we’ll make the pastry for the crust and leave it to chill. 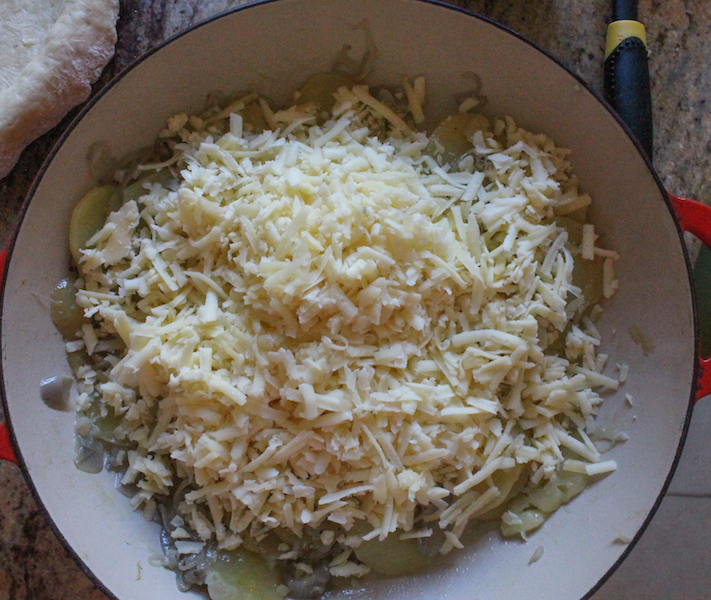 Put flour, grated cheese and salt in a big bowl. Mix well. Cut the cold butter in chunks and add to the flour/cheese mixture. 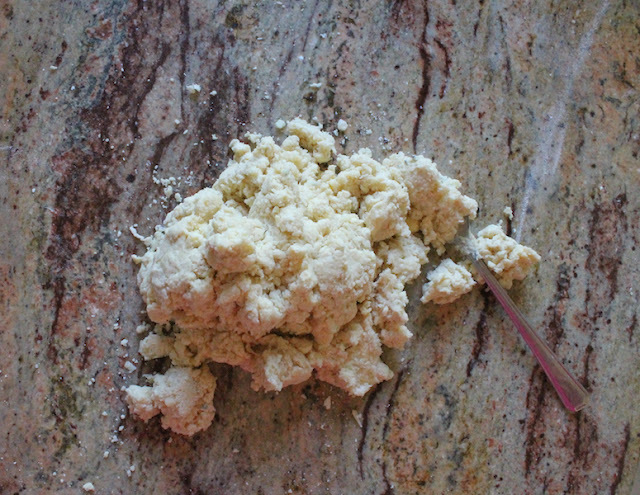 Use a pastry blender or two knives to cut the butter into the flour. You are looking for a soft sandy crumble but you can leave some larger pieces. 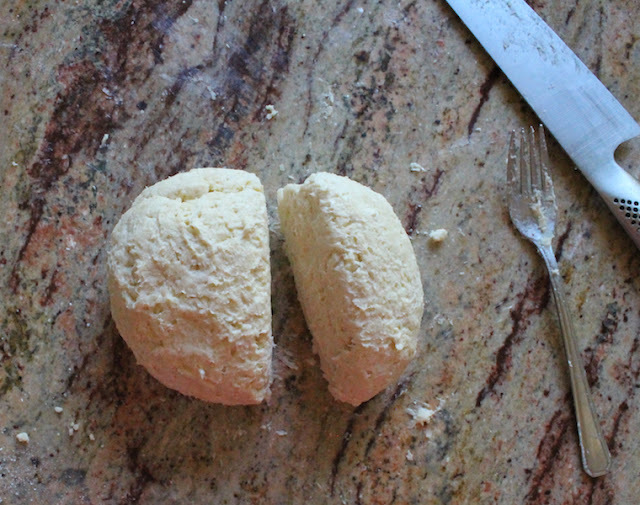 Add cold water a tablespoon at a time, mixing well in between with the tines of a fork, until the dough just comes together. Tip it out on a clean work surface and press it together. Knead briefly then cut the dough into two pieces, one slightly larger than the other. Wrap them both in cling film and refrigerate while you get on with the filling. 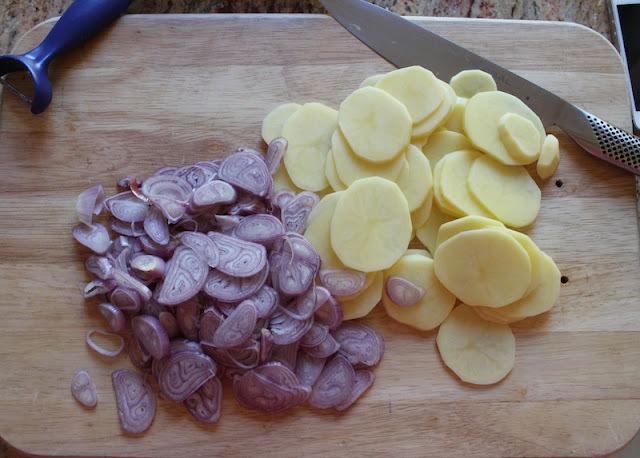 Peel and finely chop your shallots. Peel and finely slice your potatoes. Add the butter and olive oil to skillet and sauté the shallots and potatoes for a few minutes. Add a small splash of water and cover the pan and simmer for about 5-7 minutes or until the potatoes are just cooked. Season with a sprinkle of fine sea salt and a few good grinds of fresh black pepper. 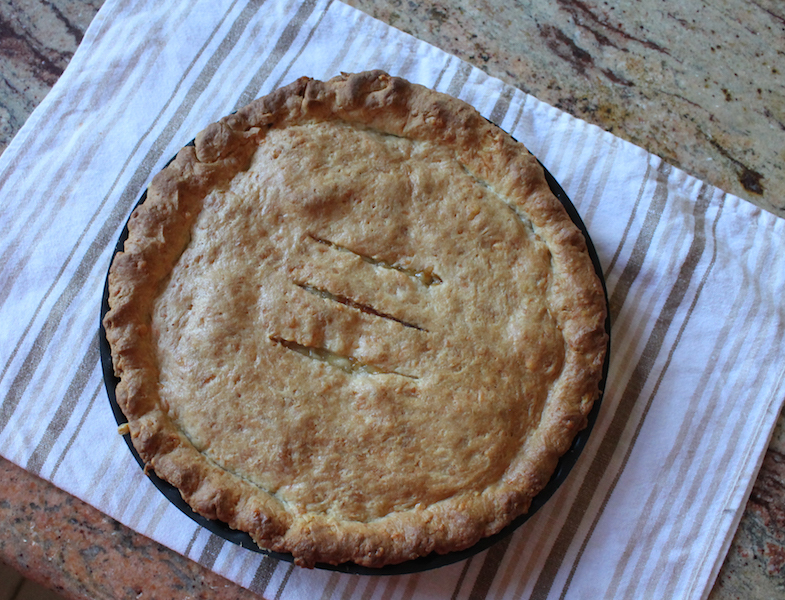 Preheat your oven to 350°F or 180°C and put a flat baking pan big enough to hold your pie plate in to preheat as well. 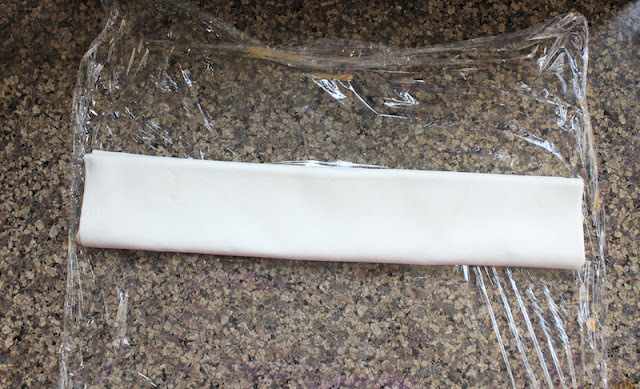 Cover your clean work surface with cling film and sprinkle lightly with flour. Remove the larger piece of dough from the refrigerator and press it into a flat disk on your prepared work surface. Flour it lightly and cover it with another sheet of cling film. 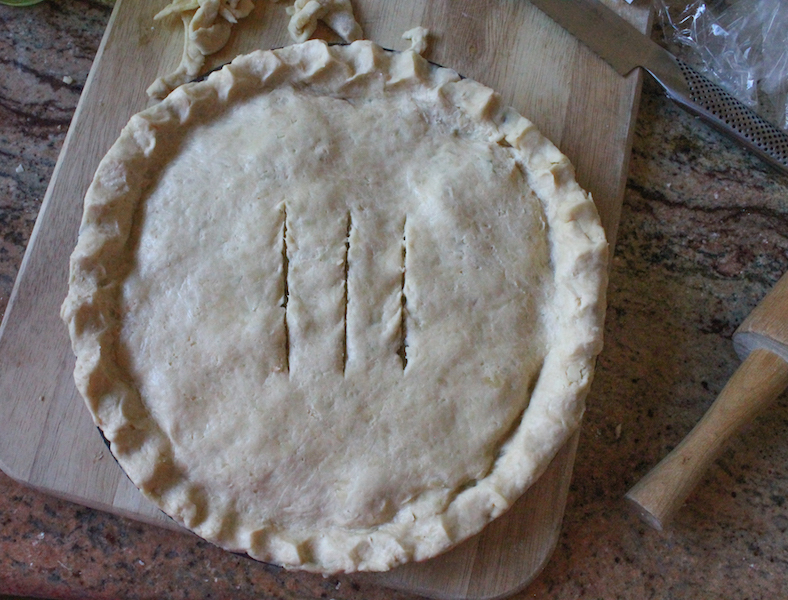 Use a rolling pin to roll the pastry into circle 1⁄8 inch thick and about 2 inches larger all around than your large pie plate. 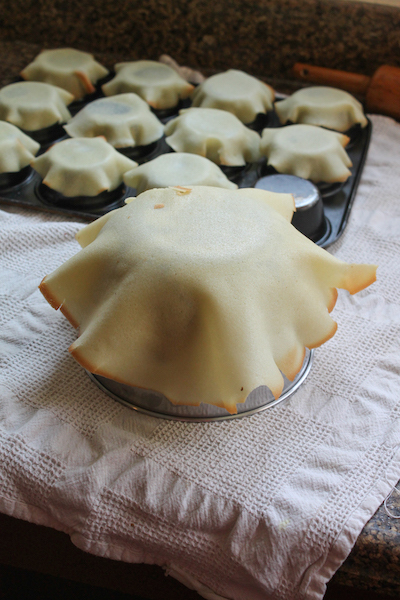 Use the cling film base to lift the pastry circle and ease it into your pie plate, leaving the edges hanging off. Prick the pie crust with a fork all over the bottom and sides. 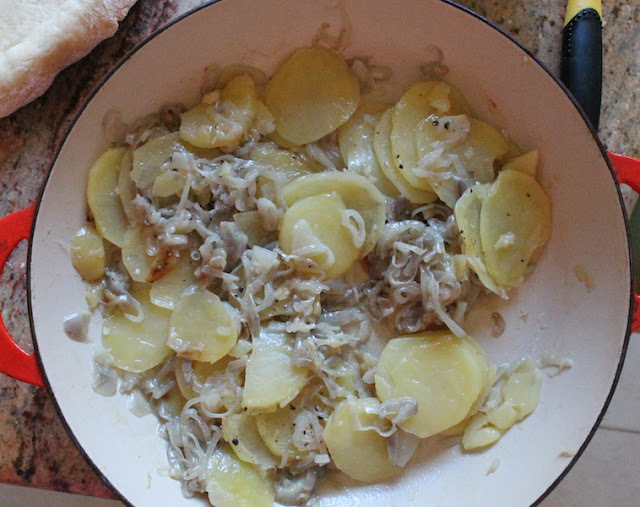 Add the grated filling cheese to the cooled skillet and gently mix it together with the shallots and potatoes, trying not to break the potatoes up. Pour the filling into the pie crust and spread it around evenly. 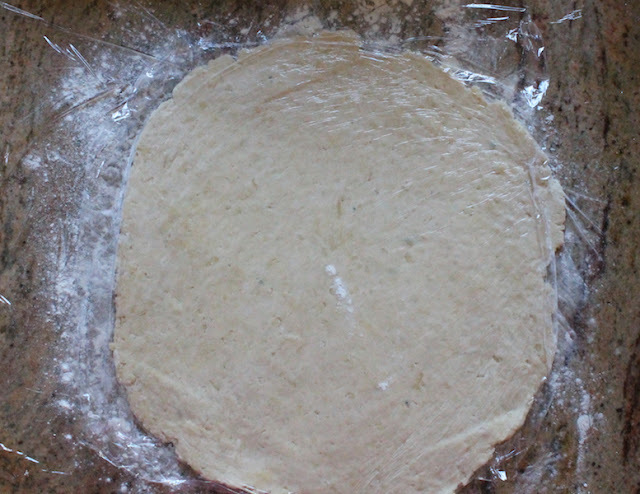 Recover your work surface with cling film, sprinkle on some flour and repeat the process of rolling out the top crust. Cover the filling with the top crust, fold any excess under with the bottom crust, and crimp the edges to hold them together. Cut three or four long slits in the top crust to let the steam out. 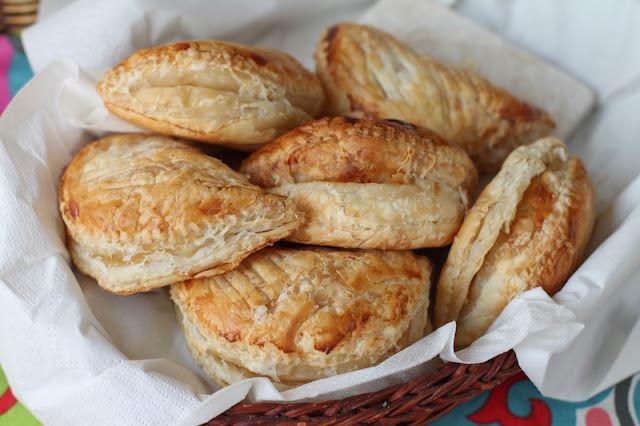 Bake in your preheated oven, on top of the flat pan, for about 50-55 minutes or until you see the filling bubbling up a little through the slits and the crust is lovely and golden. Today we’ve both gone savory. Follow this link to see her wonderful Zucchini and Tomato Pie. *Amazon affiliate link - If you buy the book by following my link, I earn a little small change from the sale, at no extra cost to you. 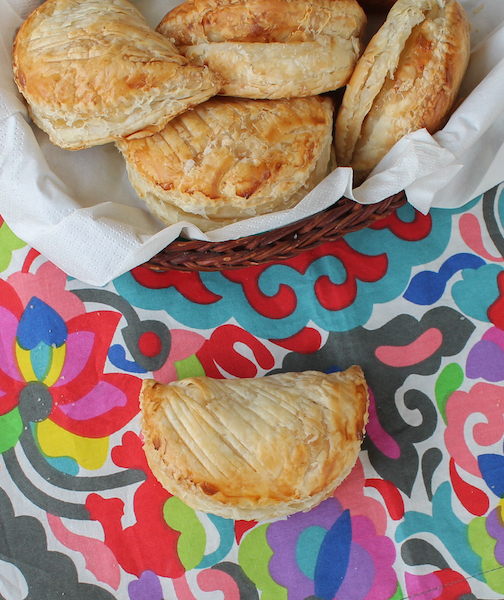 Ready rolled puff pastry spread with tahini, chilies and garlic and baked till crispy make great nibbles, perfect for a shower, birthday or even a cocktail party. Today we are celebrating our fellow blogger and sweet friend Courtney of NeighborFood who will shortly be welcoming her ”little mister.” Since we can’t actually get together, Nancy from gotta get baked has organized a virtual baby shower, which doesn’t have gifts but certainly has a lot of good food to welcome the sweet baby boy and send best wishes to his eager parents. Make sure to scroll down to see the link list to all the party food! And if you want to follow Courtney for delicious dishes and upcoming baby news, do like her blog Facebook page or follow her on Instagram. 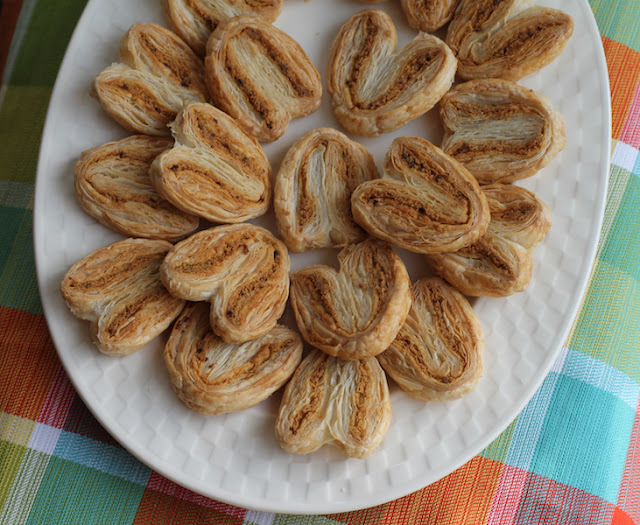 These puff pastry palmiers are so easy to make, and so delicious. I could have eaten the whole plate! 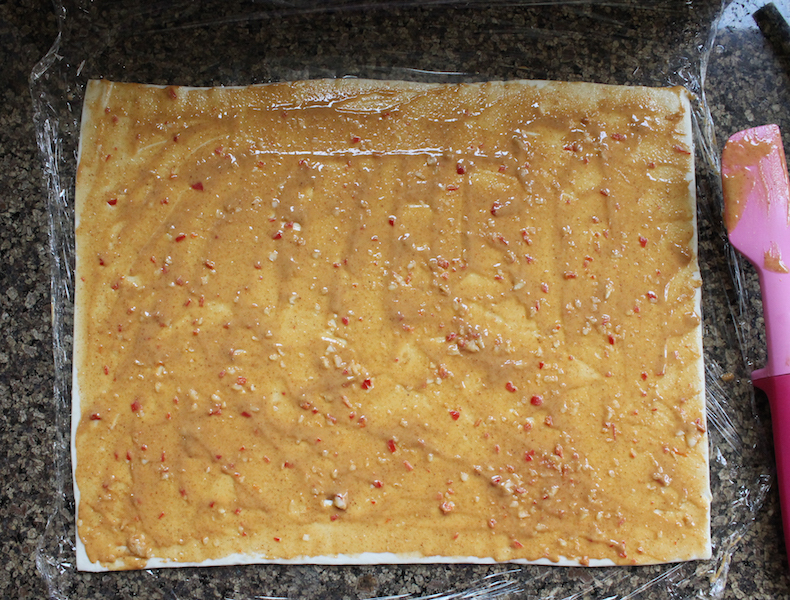 1 sheet ready rolled puff pastry, thawed. Chop chili finely. You can deseed first if you’d like to reduce the amount of spiciness. 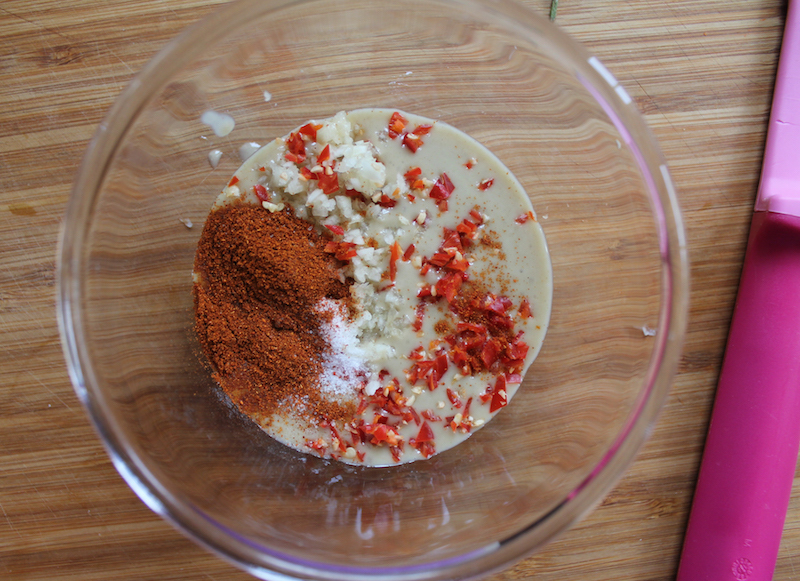 Put tahini, chopped chili, garlic, paprika and salt in a small bowl. Stir well. 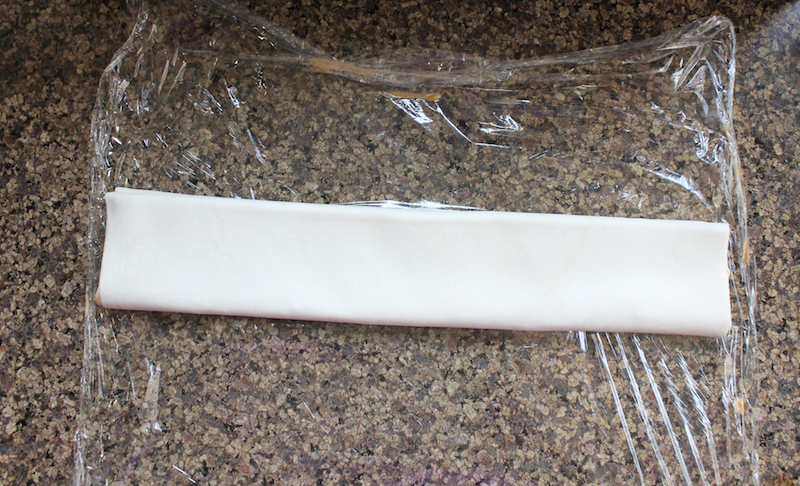 Unroll your thawed puff pastry on top of a large piece of cling film. Spread your paste evenly over the pastry, making sure to go all the way to edges. 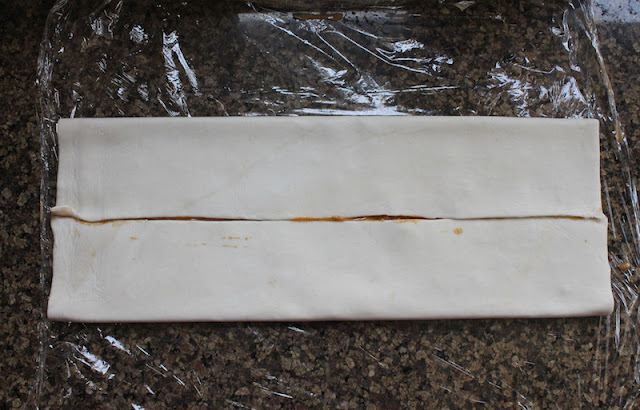 Use the cling film underneath to help you fold the bottom in to the middle. Now fold the top in to the middle. Now fold the bottom over the top side as if you are closing a long book. 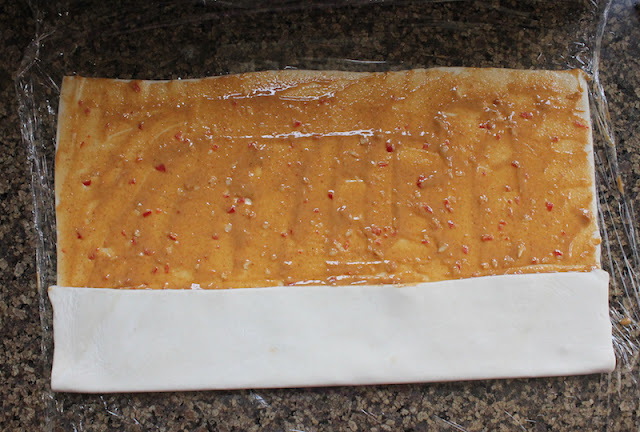 Use the cling film under the roll to tightly cover it and refrigerate for at least 30 minutes. Unwrap the roll and cut it in half. Rewrap one half and put it back in the refrigerator. 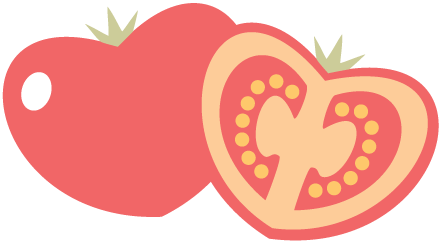 Cut the other half in half inch or 1 cm slices with a sharp knife. 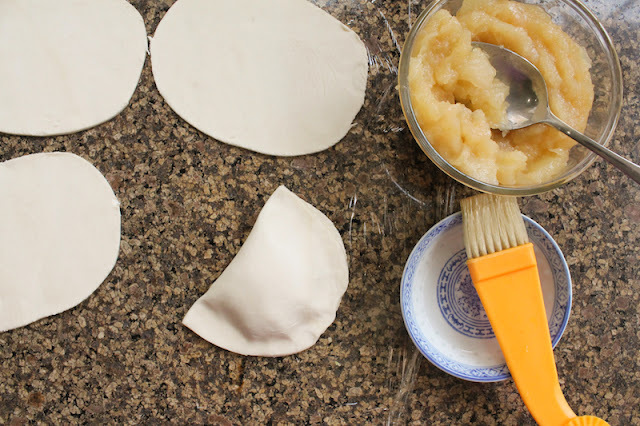 Lay the slices on a baking pan lined with parchment or a non-stick silicone mat. Leave room between them for puffing and spreading. 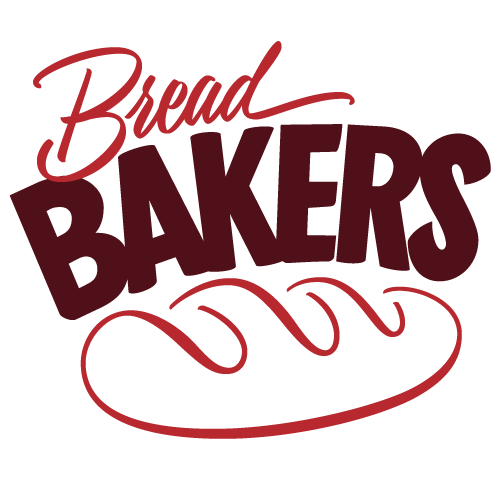 Bake for 10-12 minutes in your preheated oven on one side and then flip and bake 5-6 minutes more on the other, or until golden and crispy. Cool on a wire rack. Repeat the process with the second half of the roll. 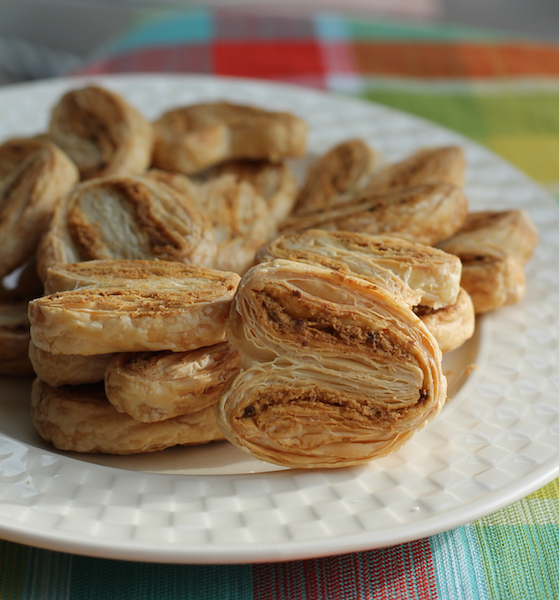 This makes about 20 spicy tahini palmiers. Check out all the divine food we are bringing along to Courtney's virtual baby shower! These crispy cookie cups are made with a rich batter, thinly spread and quickly baked, then shaped over the back of a standard muffin pan. 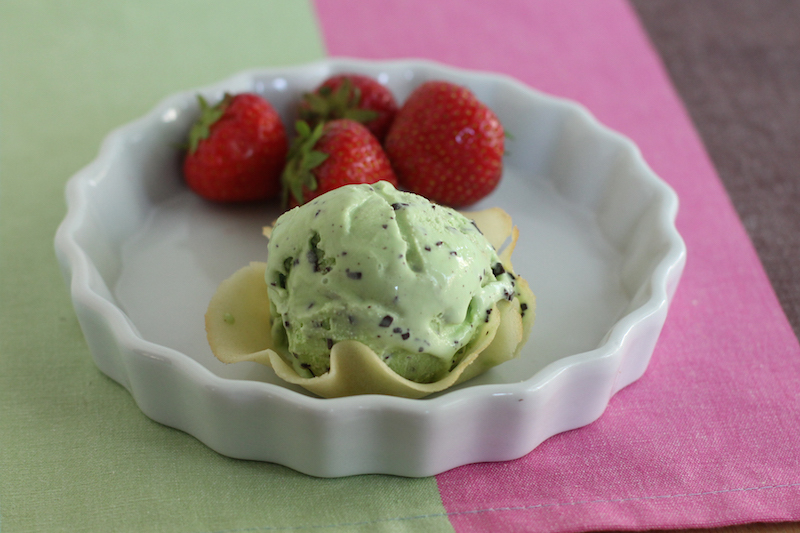 They are perfect for serving a generous scoop of ice cream. I’m on kind of a French kick right now, starting with the chaussons aux pommes I posted Sunday, and now these cookies. Because I am on holiday with my mom IN FRANCE, staying with my friend Jamie of Life's a Feast at the gorgeous Hotel Diderot. Later I'll be driving south to Bordeaux and I'll be adding trip photos on Instagram if you want to follow along. 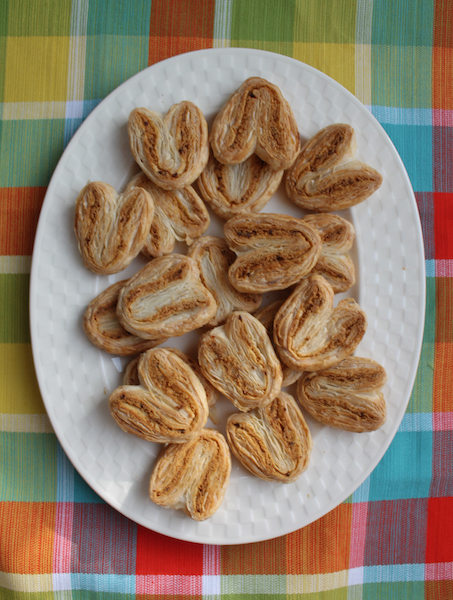 Tuile is the French word for tile and these cookies get their name because they are often draped over something cylindrical while warm - for instance a rolling pin or wine bottle - and end up looking like the roof tiles so often used in classic French homes. 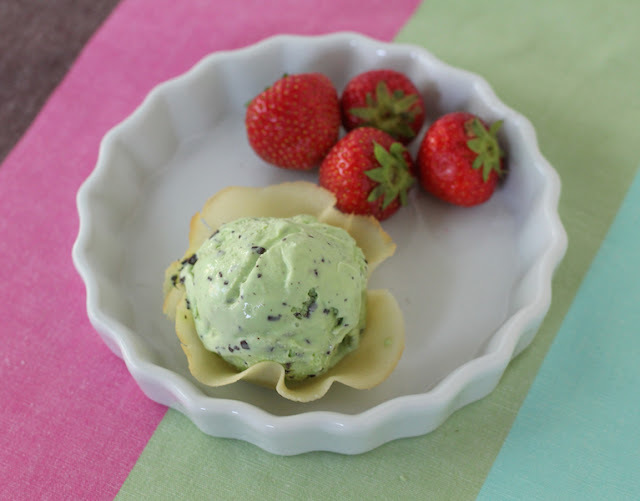 Since our theme for Creative Cookie Exchange this month is Cookies and Ice Cream, I decided it would be fun to make little cookie bowls out of them instead. The recipe below, adapted from this one on Food Network for tuile cookie cones, will easily make about one and a half dozen one scoop sized bowls. 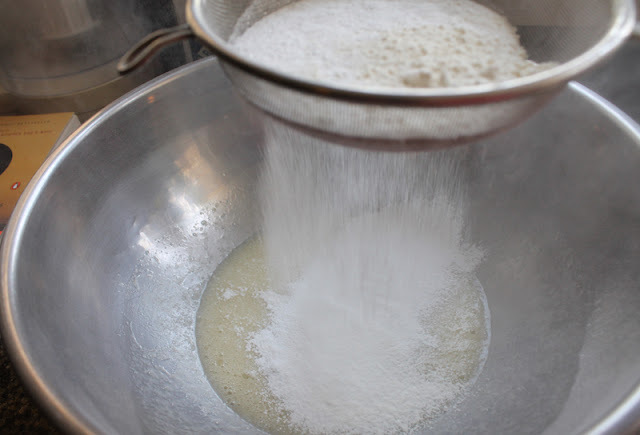 Sift the flour, powdered sugar and salt together into bowl. 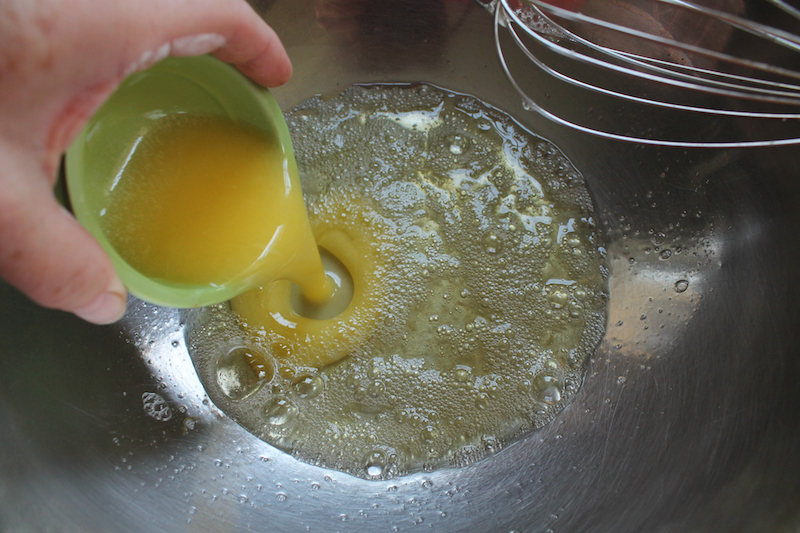 In a large bowl, whisk the egg whites, along with the vanilla, just to loosen them up. Add in the melted, cooled butter and whisk again to combine. 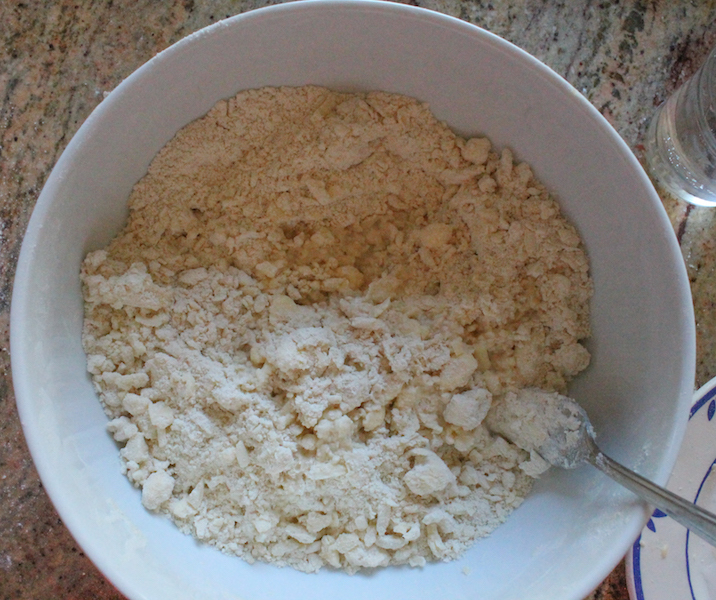 Now sift the flour/sugar mixture a second time, right into the egg white bowl. 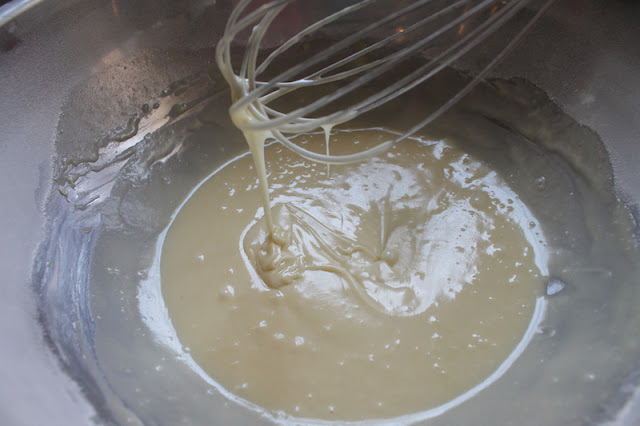 Whisk vigorously to make a smooth liquid, without any lumps. Cover the bowl with cling film and leave to rest at room temperature for about 45 minutes. Now to make nice circles with the batter, you can wing it or you can create a pattern for yourself to follow. 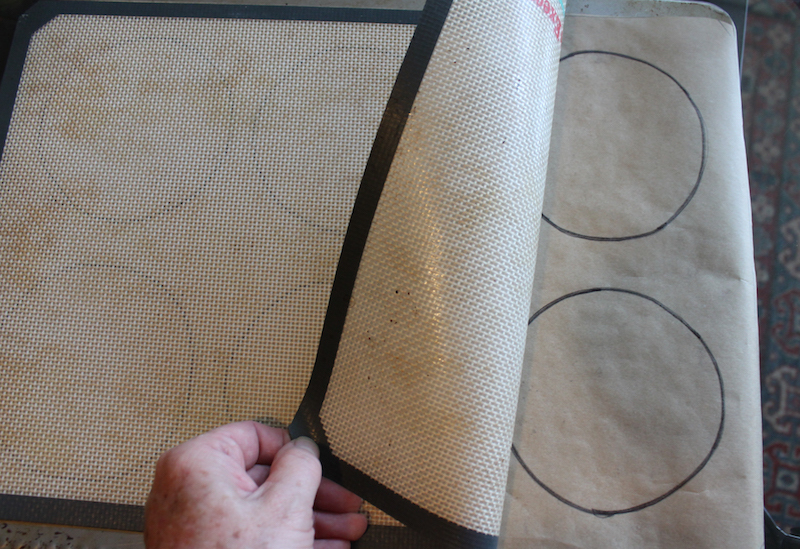 I like to draw my circles on a piece of parchment paper then slip it under my silicone mat. If I go over the pencil circles with permanent marker, they are just dark enough to see through the mat. 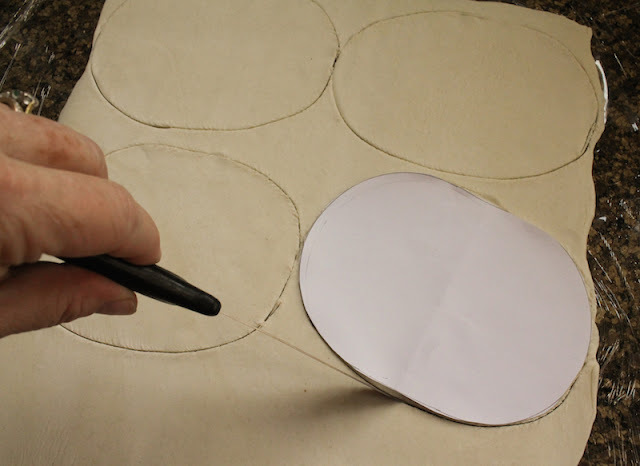 You can also draw the circles on your parchment then turn it over and use the non-marked side to spread your batter. 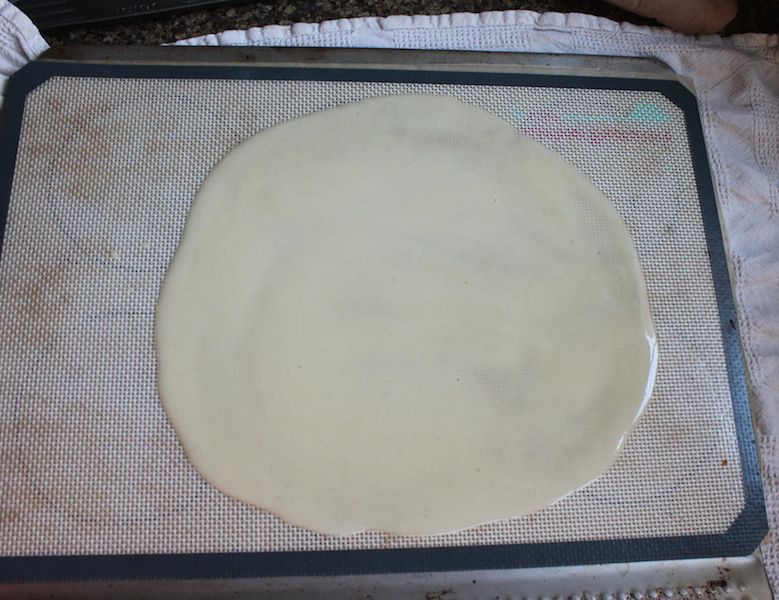 If you are using straight parchment, make yourself a few because as they get wet from the batter, they are no longer flat. You’ll want a fresh piece for each batch. Keep them though because you can reuse them for other baked goods that don't need a completely flat piece of parchment. 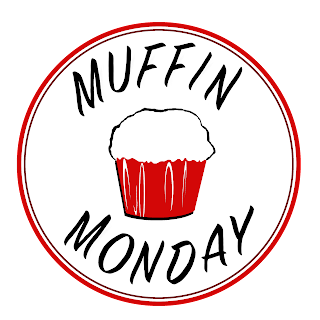 When the resting time for the batter is almost up, preheat your oven to 350°F or 180°C and grease the bottom of a muffin pan. Drop rounded tablespoons of the batter onto your prepared baking sheet. 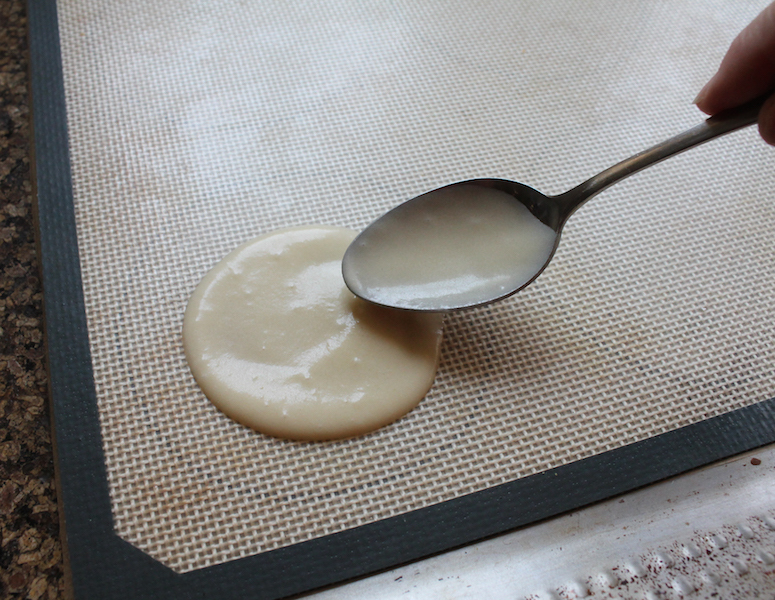 Spread the batter with the back of a spoon into 5 in or 12.7cm rounds. Or follow the circle guidelines you have drawn to make your life easier. 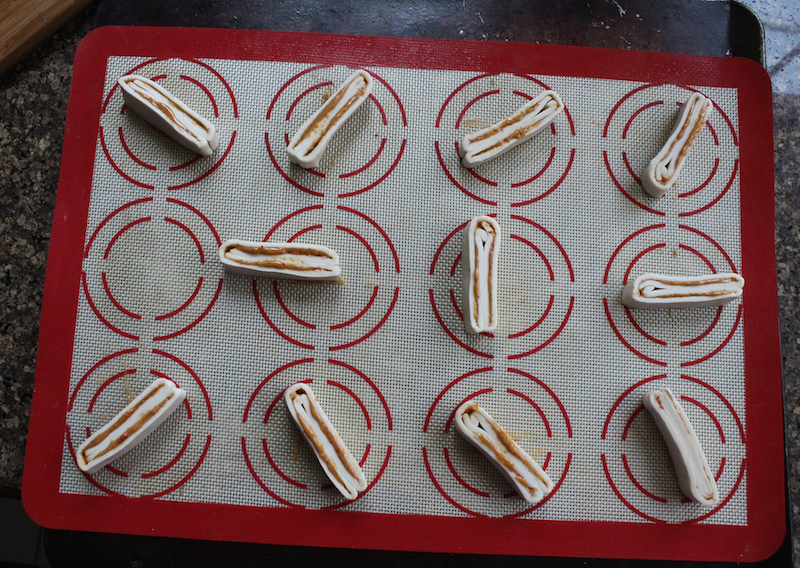 Six tuile cookies at a time is ideal. More and they harden up before you can shape them when they come out of the oven. 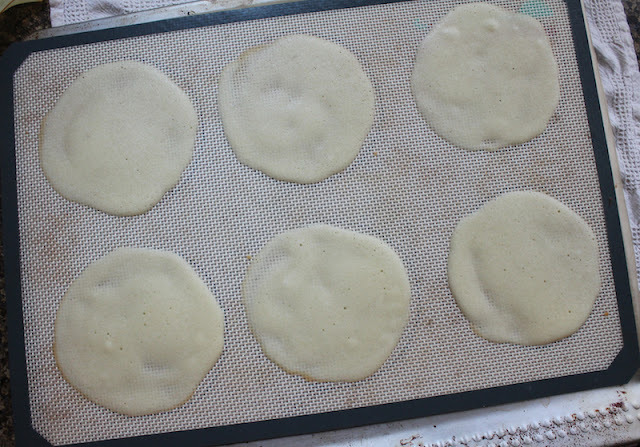 Bake in the middle of the oven until golden and very lightly brown around the edges, about 4 to 6 minutes. Watch them like a hawk! My first batch was too brown, therefore too crunchy, and then they wouldn’t mold to the shape of my muffin pan. 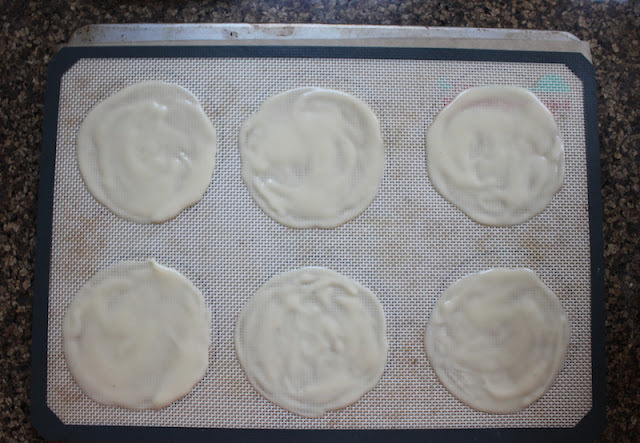 To shape, gently loosen a cookie from the baking sheet with a spatula, then turn it over so the smooth side is facing up. 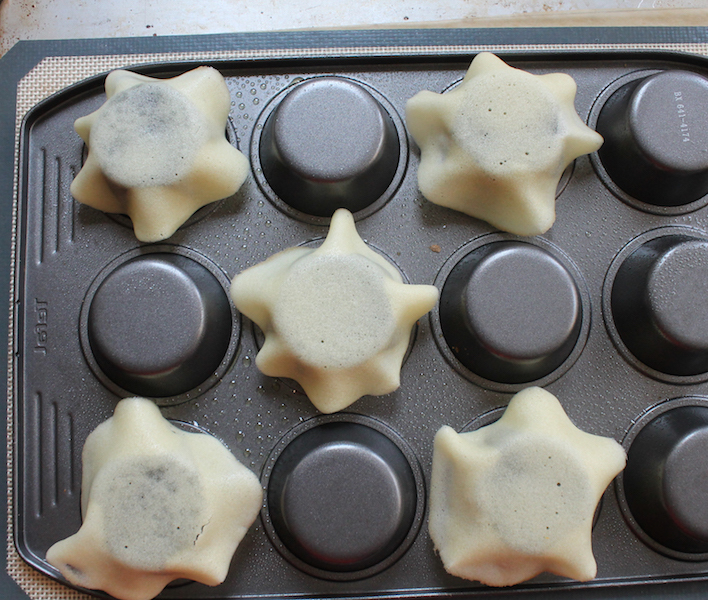 Lay the cookie on the greased bottom of your muffin pan and gently, shape it to fit. Do the others in rapid succession while they are still warm. 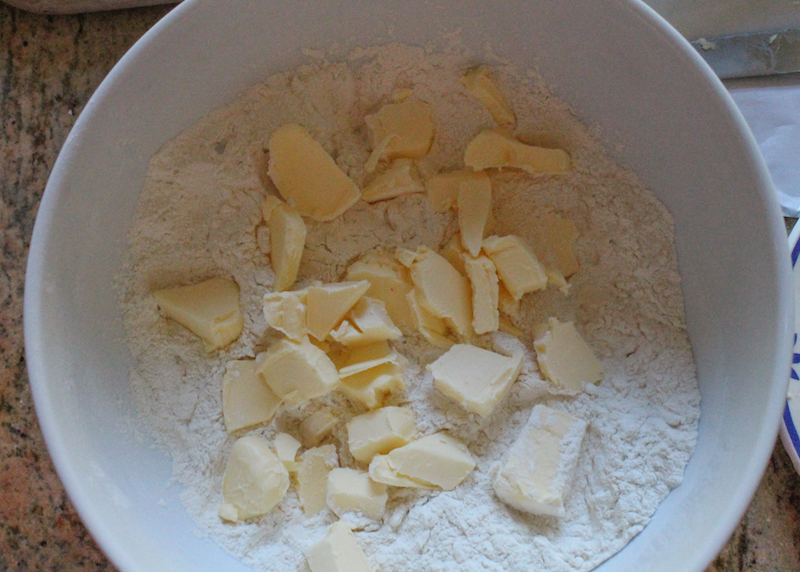 Make and shape more cookies with the remaining batter. After I had made a dozen, I decided to try to make one big bowl. I ended up making hole in the side while loosening it from the baking sheet but the bowl still came out great. Make sure the tuile cookie bowls are completely dried and crispy before storing them in an airtight container, otherwise they can go a bit soft again. Add a scoop of ice cream to each and enjoy! Many thanks to Laura from The Spiced Life for hosting and for this great theme! 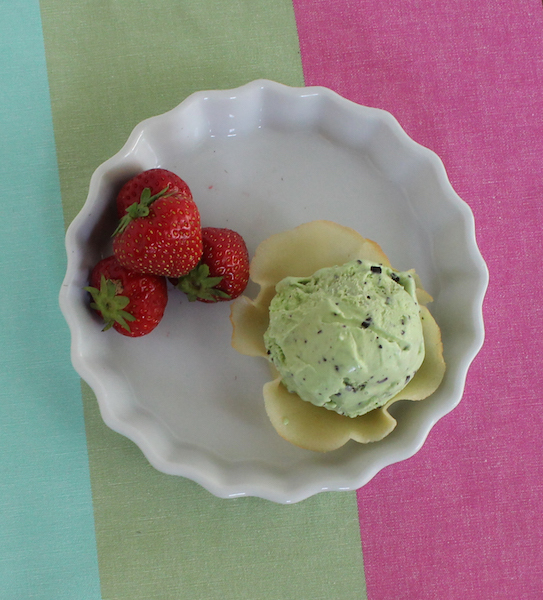 If you are a fan of ice cream and cookies – and how is not?! 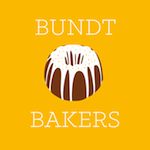 – have a look at the other great recipes we have for you this month. Crisp apples, with lemon or lime juice and zest and just a bit of sugar, cook down into the best chunky applesauce, the perfect filling for puff pastry chaussons or slippers. Le Marché du Petit Robinson – the twice-weekly market - was but a block and a half away from our house just south of Paris in the ville of L'Haÿ-les-Roses. Every Wednesday and Saturday morning, starting just before 8 a.m., the neighbors would start to filter past, the elderly pulling their two-wheeled shopping carts, the younger set pushing their children in strollers, all on their way to the market. Some days the girls and I would join them, even if we didn’t really need anything because 1. It was an outing and moms with toddlers can always use an outing, especially when the weather is grey and 2. There were always tasty items to snack on and fresh produce to peruse once we got there. We drooled over shiny fruit and the soft cheeses, often helping ourselves to the little chunks of artisan saucisson or spicy olives that were proffered for tasting but our favorite stall was always the baked goods. There were hefty seeded loaves as big as your head and almost as heavy; rustic baguettes with their crunchy exteriors and chewy interiors full of holes and flavor; pain aux raisins, spirals of buttery pastry filled with raisins and brushed to a high gloss with a sticky sweet glaze and last but never least, little puff pastry “slippers” which had been filled with chunky applesauce and baked till fluffy and golden. If you arrived early enough some were still warm! When I read that the theme for this week’s Sunday Supper was Farmstand Foods, I couldn’t resist trying to recreate the little chaussons or slippers. Just the aroma of them baking in the oven brought me back! Isn’t it funny how smells can evoke such strong memories, perhaps even more than photos will do? 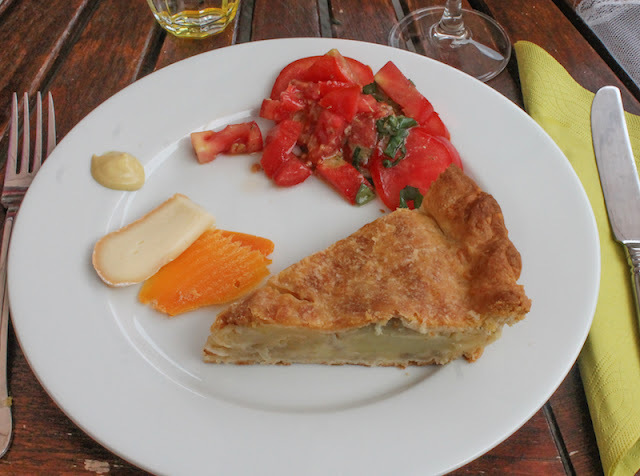 Two years ago for a similar Sunday Supper theme, we celebrated farmer's markets and I posted a number photos from a French market for those who wanted to drool a little. This seems like a good time to share them again, along with my cherry clafoutis. 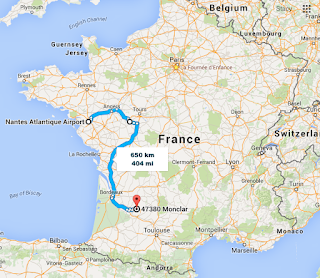 In the wee hours of tomorrow morning, I’ll be headed back to France for a visit and you can be certain that I’ll be browsing as many markets as I can find along my road trip route from Nantes to Chinon and down to Bordeaux! My recipe was adapted from this one on Meilleur du Chef. You may not use it all of the applesauce in the chaussons, but it is also delicious eaten straight from the bowl with a spoon. Zest and juice your lemon or lime and put the zest and juice in a bowl that will be large enough to hold your apples, once peeled and chopped. Peel, core and chop your apples into chunks. Add them to the juice bowl, as each one is done and stir well. This will stop the apples from turning brown. 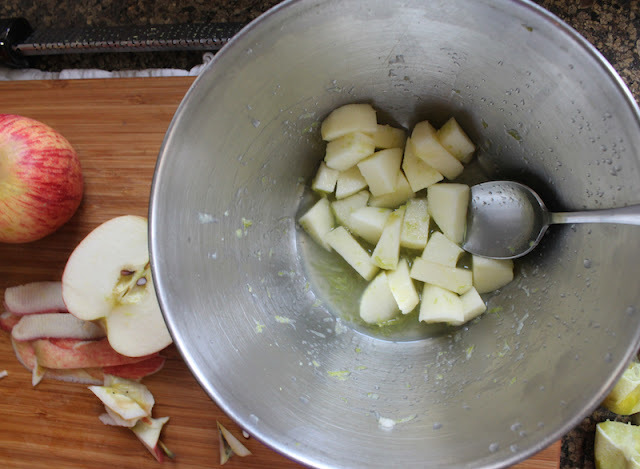 Pour the apples into a small pot that has a lid and add in the sugar, butter, vanilla and salt. Stir well. Cook over a medium flame, covered for the first 15-20 minutes, stirring occasionally. There is no need to add liquid, as the apples will release their juice. After the apples start to soften, you can remove the lid and lower the flame. 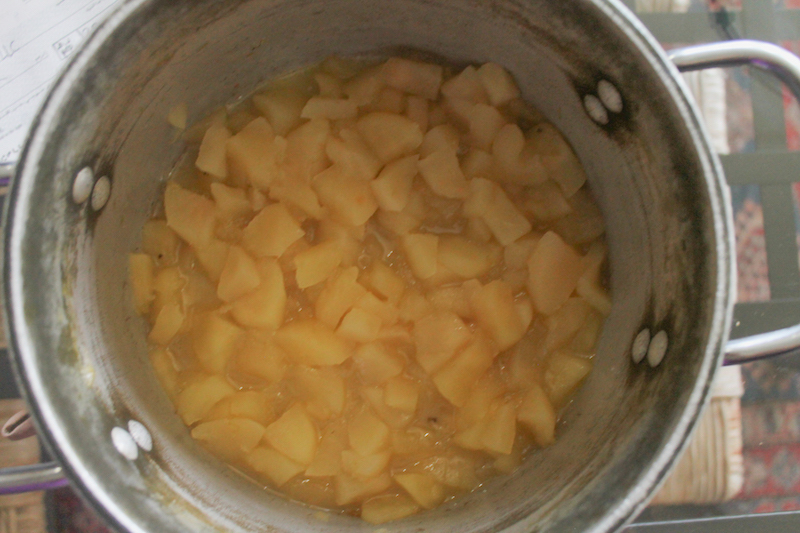 Let the apples cook until the liquid is just about gone and you have a thick, chunky applesauce. You can mash gently with a fork but make sure to leave some chunks. Allow to cool and taste to see if you need a little more sugar. I didn’t add any but I like things tart. Preheat your oven to 350°F or 180°C and prepare a baking sheet by lining it with baking parchment or a silicone mat. Meanwhile, line your clean work surface with cling film and make a template out of paper. I used a very large coffee mug and traced the two halves of the base about an inch and a half or three centimeters apart, then connected the halves to create an elongated shape that is not quite oval, but rather a circle that’s been stretched in the middle. (Actual dimensions: 10 x 14cm or 4 x 5.5 in) You can make a simple circle, instead of the traditional “slipper” shape, but you won’t have as much room for filling. Roll out your puff pastry on the cling film big enough to accommodate at least six of your template. 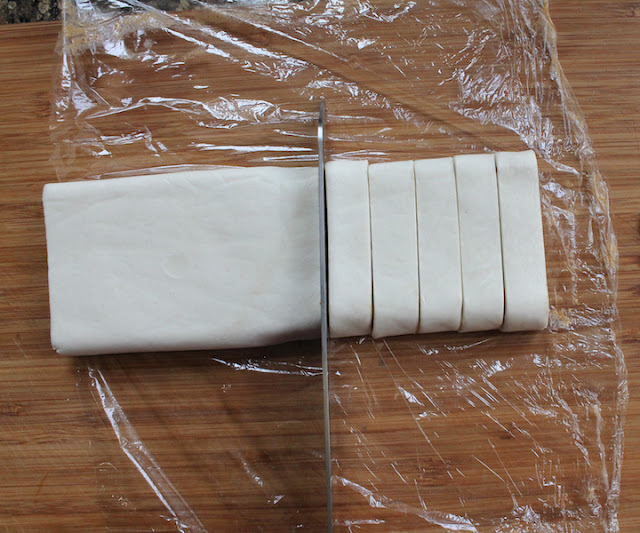 Lay the template on the puff pastry and cut around it with a sharp knife, taking care not to cut all the way through the cling film. 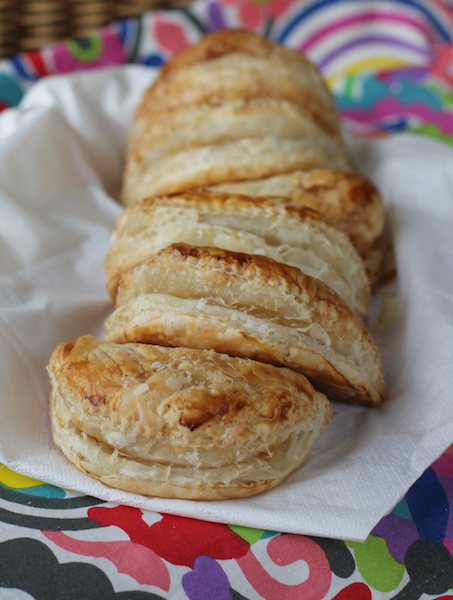 Brush the puff pastry that remains with a little water around the edges and add a healthy spoon of applesauce in the middle of each. 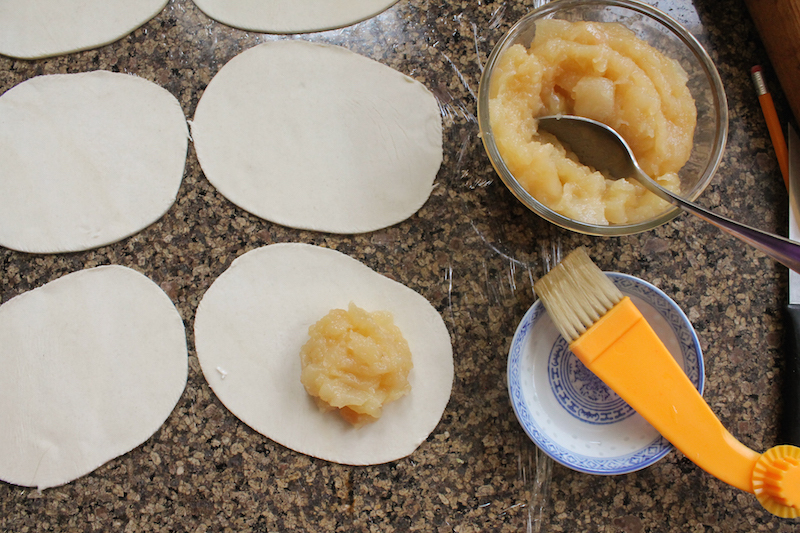 Fold one side over and gently try to remove all of the air inside as you seal the edges together. 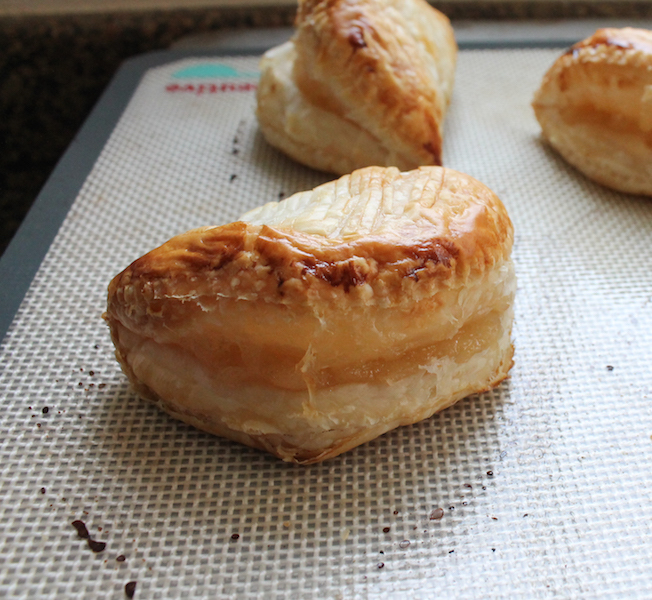 Transfer the chaussons to your prepared baking sheet. If they are stuck down, lift the cling film from under them to help them release. 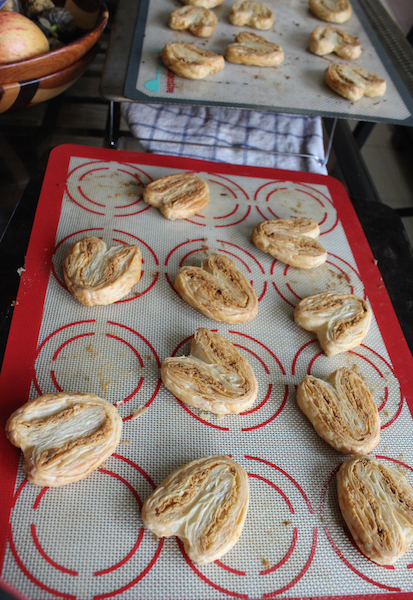 If you have a pastry cutter, you can make a decorative edge but this is completely optional. Lightly score the tops of the chaussons with a sharp knife, making sure not to cut all the way through. I use my negi cutter for this job but any very sharp knife or a lame will do. 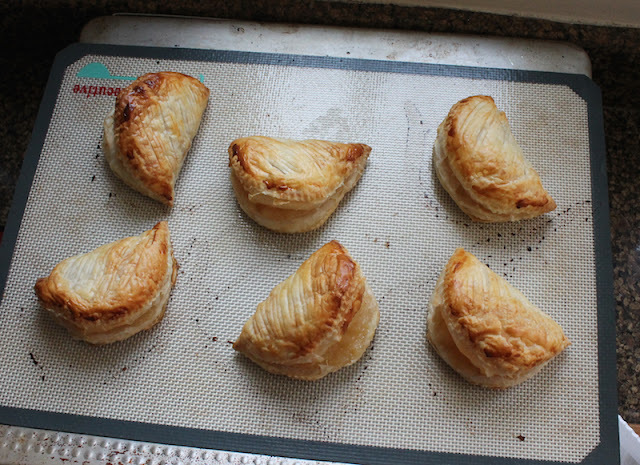 Brush the tops with a little milk and bake in your preheated oven for about 20-25 minutes or until golden and puffy. They are super puffy when they first come out. Then they deflate a little. 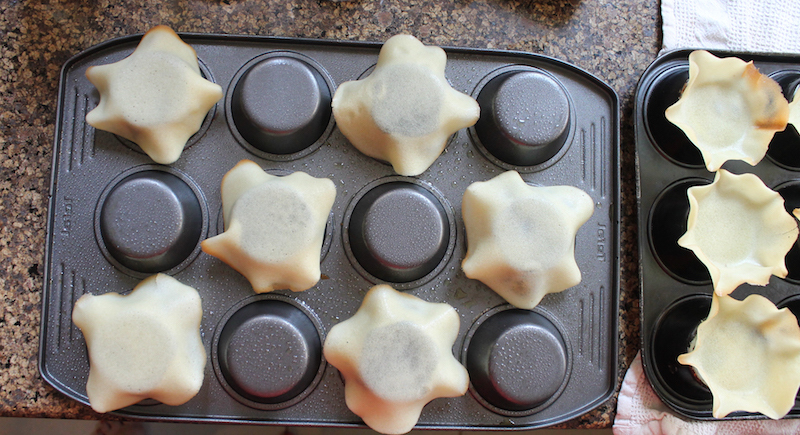 Allow the chaussons to cool somewhat before biting into one. 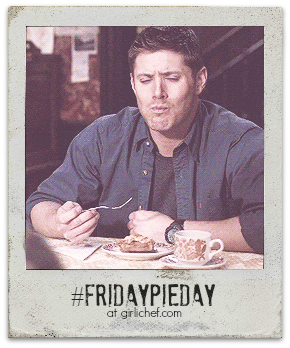 That applesauce is going to be hot! Many thanks to our Sunday Supper host for the Farmstand Food event, Colleen of FoodieTots, ably assisted by veteran host, DB of Crazy Foodie Stunts. Fennel and Orange Salad by Feeding Big - and more!